Application of the B-SAHF (Building, Smoke, Air Track, Heat, &amp; Flame) organizing scheme for critical fire behavior indicators to photographs or video of structure fires provides an excellent opportunity to develop your knowledge of fire behavior and skill in reading the fire. This post uses a short video clip from Providence, RI to provide an opportunity to practice reading the fire. Where do you think the fire is located? Why? Do you observe any changes in conditions? What might these changes indicate? What avenues of fire spread would be of concern? How does this relate to building factors? It appears that horizontal ventilation is being conducted by interior crews on Floor 2, Side A. How is this likely to influence interior conditions and fire behavior? On March 24, 1994 Captain Drennan and Firefighters Young and Seidenburg of the FDNY were trapped in the stairwell of a three-story apartment building �by rapid fire progression that occurred as other companies forced entry into the fire apartment on the floor below. The FDNY requested assistance from National Institute for Standards and Technology (NIST) in modeling this incident to develop an understanding of the extreme fire behavior phenomena that occurred in this incident. A short case study of the 62 Watts Street incident was presented in my last post. As a brief review, FDNY companies responded to 62 Watts Street for a report of smoke and sparks coming from the chimney (see Figure 1). On arrival, there was no indication of a serious fire in the building. Companies opened the scuttle over the stairwell and stretched a line to the first floor apartment while Captain Drennan and the other members of the Ladder 5’s inside team proceeded to the second floor to search for occupants. When the door to the first floor apartment was opened, air rushed in and then warm smoke pushed out. This pulsation in the air track at the door was followed by a flaming combustion filling the upper portion of the door and almost immediately filling the stairwell. Firefighters on the first floor were able to escape, while Captain Drennan and Firefighters Young and Seidenburg were trapped on floor 2. FDNY asked NIST to assist in developing a computerized model to aid developing an understanding of the fire behavior phenomena that occurred during this incident. Hypothesis: The fire burned for over an hour under severely ventilation controlled conditions resulting in production of a large quantity of unburned pyrolyzate and products of incomplete combustion. Opening the apartment door allowed exhaust of warm fire gases and inflow of cooler ambient air, resulting in a combustible fuel/air mixture. Bukowski (1995) does not identify a source of ignition. However, it is likely that the combustible fuel/air mixture underwent piloted ignition as flaming combustion resumed in the apartment. Once the gas phase fuel was ignited, flaming combustion extended from the door through the stairwell to the ventilation opening at the roof. Richard Bukowski of the NIST Building and Fire Research Laboratory modeled the fire using CFAST to determine if a sufficient mass of gas phase fuel could have accumulated in the apartment to account for the severity and duration of flaming combustion that occurred. CFAST is a two-zone fire model used to predict the distribution of smoke and fire gases and temperature over time in a multi-compartment structure subjected to a fire. A two-zone model is based on calculations that describe conditions in the upper and lower layers (see Figure 2). While there are obvious differences in conditions within each of these zones, these differences are relatively small in comparison to the differences between the two zones (Jones, Peacock, Forney, & Reneke, 2005). Bukowski’s (1995) model of the Watts Street fire divided the involved area of the structure into three compartments. The apartment was defined as a single 6.1 m (20′) x 14 m (46′) x 2.5 m (8’3″) compartment. The stairwell was defined as a second 1.2 m (4′) x 3 m (10′) x 9.1 m (30′) compartment connected to the apartment by a closed door and having a roof vent with a cross sectional area of 0.84 m2 (9 ft2). The fireplace flue was defined as a vertical duct with a cross section of 0.14 m (1.5 ft2) x 10 m (33′). 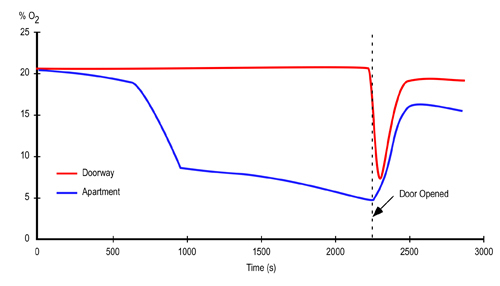 The heat release rate in the initial growth phase of a compartment fire is nearly always accelerating with energy release as the square of time (t2). Multiplying t2 by a factor ?, various growth rates (e.g., ultra-fast, fast, medium, slow) can be simulated (Karlsson & Quintiere, 2000). 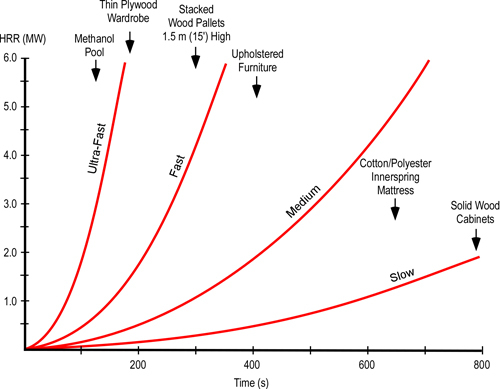 Based on experimental data from burning trash bags, Bukowski (1995) estimated the initial heat release rate at 25 kW with the fire transitioning to a medium t2 fire (typical of residential structure contents) which would have had a peak HRR of 1 MW, but did not reach this HRR due to limited ventilation. Figure 3. Heat Release Rate of Growth Phase t2 Fires. Note: Adapted from CFAST – Consolidated model of fire growth and smoke transport (Version 6). 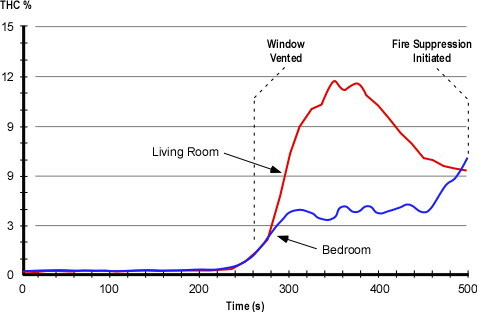 Results of the computer model indicated that the HRR of the fire in the apartment grew to a heat release rate of 0.5 MW (see Figure 4) and then HRR decreased rapidly as oxygen concentration dropped below 10% (see Figure 5). As the fire continued to burn under extremely ventilation controlled conditions, the concentration of unburned pyrolizate and flammable products of incomplete combustion in the apartment continued to increase. Note: Adapted from Modeling a Backdraft: The 62 Watts Street Incident. Research indicates that the concentration of gas phase fuel (e.g., total hydrocarbons, carbon monoxide) is a critical determinant in the likelihood of backdraft occurrence. In small scale, methane fueled compartment fire experiments, Fleischmann, Pagni, & Williamson (1994) found that a total hydrocarbon concentration >10% was necessary for occurrence of a backdraft.� At lower concentrations, flame travel is slow and compartment overpressure is lower. As total hydrocarbon concentration increased, the overpressure resulting from backdraft increased. Similarly, Weng & Fan (2003) found mass fraction (concentration by mass) of unburned fuel to be the critical determinant in the occurrence and severity of backdraft. In their small scale, methane fueled experiments, increases in mass fraction of unburned fuel resulted in increased overpressure and more severe backdraft explosions. Both of these research projects involved use of a methane burner in a compartment and the researchers identified the need for ongoing research using realistic, full scale compartment configurations and fuel loads. Estimating the time that fire companies forced the door to the apartment, the front door in the simulation was opened at 2250 seconds. As in the actual incident, there was an outflow of warm air from the upper part of the doorway, followed by inward movement of ambient air in the lower part of the doorway. Almost immediately after this air track pulsation, the heat release rate in the stairwell increased to nearly 5.0 MW (see Figure 5), and raising temperature in the stairwell to in excess of 1200o C (2200o F). 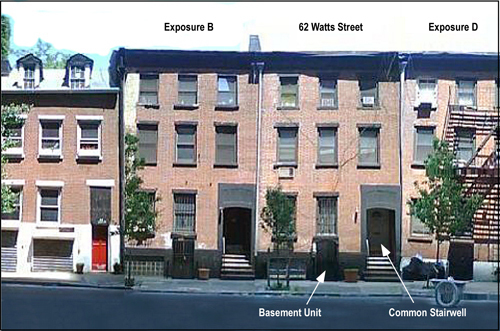 Output from the CFAST model was consistent with the observation and conditions encountered by the companies operating at 62 Watts Street on March 28, 1994.� The model showed that sufficient fuel could have accumulated under the ventilation controlled conditions that existed in the tightly sealed apartment to result in the extended duration and severity of flaming combustion that occurred in the stairwell. Following this investigation, FDNY identified a number of similar incidents that had occurred previously, but which had gone unreported because no one had been injured. Remember that it is important to examine near miss incidents as well as those which result in injuries and fatalities. Examine the oxygen concentration and temperature curves (Figures 5 & 6) up to the time that the door of the apartment was opened (2250 seconds). How does this data fit with the observations of the company making entry into the first floor apartment and your conception of conditions required for a backdraft? 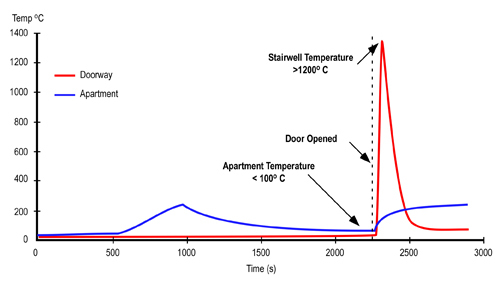 How might the temperature in the apartment have influence B-SAHF indicators visible from the exterior an when performing door entry during this incident? In Modeling a Backdraft Incident: The 62 Watts St (NY) Fire, Bukowski (1995) states “as buildings become better insulated and sealed for energy efficiency such hazards [e.g., ventilation controlled fires, increased concentration of gas phase fuel, backdraft] may become increasingly common. Thus, new operational procedures need to be developed to reduce the likelihood of exposure to flames of this duration” (p. 5) What operational procedures and practices would be effective in reducing risk and mitigating the hazards presented by ventilation controlled fires in energy efficient buildings? Consider size-up and dynamic risk assessment as well as strategies and tactics. The often oversimplified tactical approach to dealing with potential backdraft conditions is to ventilate vertically. In this case, existing roof openings were used to ventilate the stairwell, but this had no impact on conditions in the apartment. How can tactical ventilation be used effectively (or can it) when faced with potential backdraft conditions on a lower floor or in a basement? Another, less common approach to dealing with potential backdraft conditions is to cool the atmosphere and� inert the space with steam to reduce the potential for ignition. Examine the temperature curve prior to opening of the door (2250 seconds) and determine if this was a viable option? Bukowski’s (1995) paper did not speak to the door entry procedures used by the companies at the apartment door. How might good door entry procedures have reduced risk in this incident? Jones, W., Peacock, R., Forney, G., & Reneke, P. (2005). CFAST – Consolidated model of fire growth and smoke transport (Version 6) Retrieved March 15, 2009 from http://cfast.nist.gov/Documents/SP1026.pdf. Fifteen years ago tomorrow, three members of the Fire Department of the City of New York (FDNY) lost their lives while conducting search in a three story apartment building located at 62 Watts Street in Manhattan. Captain Drennan and Firefighters Young and Seidenburg were trapped in a stairwell by rapid fire progression that occurred as other companies forced entry into the fire apartment on the floor below. This case study was developed using a paper written by Richard Bukowski (1996) of the National Institute for Standards and Technology (NIST) Building and Fire Research Laboratory (BFRL). The FDNY requested the NIST assistance in modeling this incident to develop an understanding of the extreme fire behavior phenomena that took the lives of Captain Drennan and Firefighters Young and Seidenburg. 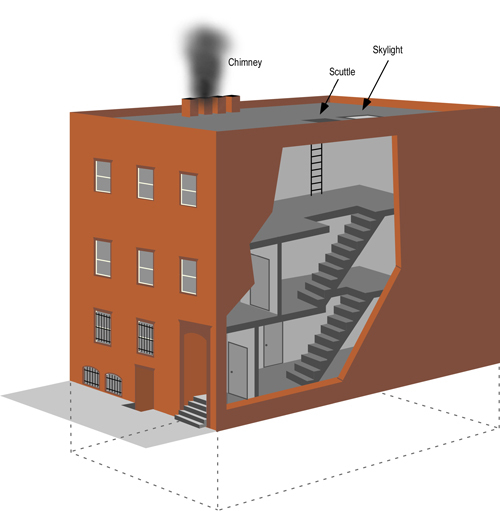 At 1936 hours on March 28, 1994, FDNY responded to a report of heavy smoke and sparks from a chimney of a three-story apartment building at 62 Watts Street (see Figure 1) in Manhattan. On arrival companies observesd smoke from the chimney, but no other evidence of fire. The first due engine and truck companies stretched a hoseline to the first floor unit and vertically ventilated over the stairwell. Working as the inside team of the second due truck company, Captain John Drennan (Ladder 5), Firefighter James Young, and Firefighter Christopher Seidenburg (both detailed from Engine 24 to Ladder 5) went to the second floor to begin primary search of the upper floors. At the doorway to the second floor apartment unit they were trapped by an explosion and rapid fire progression from the first floor apartment up the common stairwell. Both firefighters died within 24 hours as a result of thermal injuries. Captain Drennan survived for 40 days in the burn unit before succumbing to his injuries. The fire occurred in a 6.1 m (20′) x 14 m (46′), 3 � story apartment building of ordinary (Type III) construction, containing four dwelling units (the basement apartment was half below grade). Each unit had a floor area of slightly less than� 81.7 m2 (880 ft2). The basement unit had its own entrance and the units on Floors 1-3 were served by a common stairwell on Side D of the building (see Figure 1). Exposure B was an attached building identical to the fire structure. Exposure D was a similar structure. Neither exposure was involved. Note: Adapted from Modeling a Backdraft Incident: The 62 Watts St. (NY) Fire. The building was originally built in the late 1800s and had undergone numerous renovations. Recent renovations involved replacement of plaster and lath compartment linings with drywall over wood studs and lowering of the ceiling height from 2.8 m (9’3″) to 2.5 m (8’4″). All apartments had heavy wood plank flooring. During the latest renovation, windows and doors were replaced and extensive thermal insulation added to increase energy efficiency. The building was originally heated with the use of multiple fireplaces in each apartment. However, most of these had been sealed shut. However, the fireplace in the living room of the first floor apartment (unit of origin) was operable and had a 0.209 m2 (2.25 ft2) flue. All apartments had similar floor plans (differences resulting from location of the stairwell). 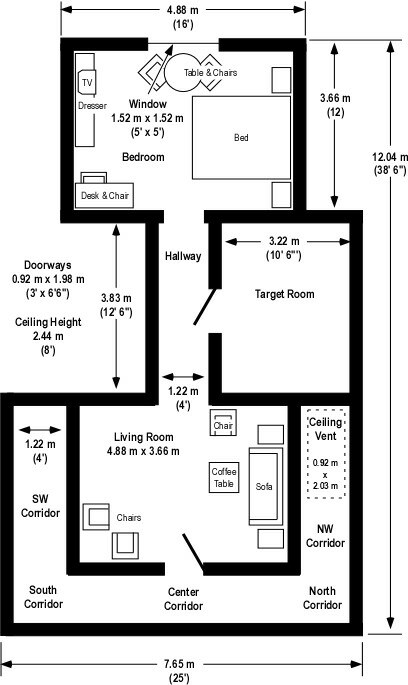 The floor plan of the first floor apartment (unit of origin) is illustrated in Figure 2. Each apartment consisted of a living room, kitchen, bathroom, and bedroom. The first floor unit had an office constructed within the bedroom. The structure had a flat roof with a scuttle and skylight over the stairwell. The occupant left the first floor apartment at 1825 hours, leaving a plastic trash bag on top of the gas fired kitchen range (see Figure 2). Investigators deduced that the bag was ignited by heat from the pilot light. Fire extended from the bag of trash to several bottles of high alcohol content liquor located on the counter adjacent to the stove. The fire progressed into the growth stage, involving other fuel packages within the apartment. The apartment was tightly sealed with the only sources of ventilation being the open fireplace flue and minimal normal building ventilation. The weather was 10o C (50 o F) with no appreciable wind. On arrival companies observed smoke from the chimney of the apartment building, but no other signs of fire from the exterior. The outside team from the first due truck went to the roof and opened the scuttle over the stairwell while the first arriving engine company stretched a hoseline to the interior and prepared to make entry into the first floor apartment along with the inside team from the ladder company. Ladder 5 was the second due truck. The inside team from Ladder 5, Captain Drennan, Firefighter Young, and Firefighter Seidenburg, went to the second floor to begin primary search. When the first due engine and truck forced the door to the first floor apartment they observed a pulsing air track consisting of an inward rush of air followed by an outward flow of warm (not hot) smoke. This single pulsation was followed by a large volume of flame from the upper part of the door and extending up the stairwell. The crews working on Floor 1 were able to escape the rapid fire progression, but Ladder 5’s inside team was engulfed in flames which filled the stairwell. Flames extended from the doorway of the first floor apartment through the stairwell and vented out the scuttle opening and skylight. This flaming combustion continued in excess of 6 minutes 30 seconds. The intense fire in the stairwell severely damaged the stairs and melted the wired glass in the skylight. Other than smoke and sparks from the chimney, what B-SAHF indicators might have been present and visible from the exterior or at the doorway that may have provided an indication of conditions inside the apartment? What do you make of the observations of the company making entry to the first floor apartment for fire attack? Is this consistent with your understanding of backdraft indicators? Why or why not? What steps can you take when making entry if you suspect that the fire is ventilation controlled? How would this change if you suspected or saw indicators of potential backdraft conditions? 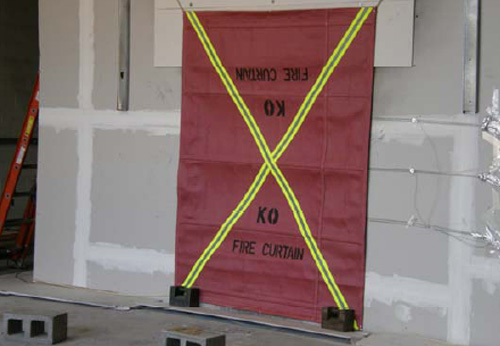 Firefighters often identify vertical ventilation when given a scenario where backdraft indicators are present. If there is value (savable people or property) and the fire is on a lower floor (as it was in the Watts Street incident), what tactical options are available to mitigate the hazards of potential backdraft conditions? My next post will examine the results of this investigation and how the computer modeling performed by NIST contributes to our understanding of the events that took the lives of Captain Drennan and Firefighters Young and Seidenburg. Language has a substantial influence on what and how we think. “What a man cannot state he does not perfectly know, and conversely the inability to put his thoughts into words sets a boundary to his thought” (Newbolt, Bailey, Baines, Boas, Davies, Enright, et al., 1921, p. 20). While the authors of this statement were focused on English language education in English schools in the 1920’s, the underlying concept applies equally well today. Language is the foundation of understanding. While this is true in day-to-day life, it is equally (or even more) important when dealing with scientific concepts and phenomena related to firefighting. While construction and fuel loading vary to some extent, fire services around the world are challenged by similar fire problems in the built environment. Each of us faces the same processes of compartment fire development and extreme fire behavior phenomena such as flashover, backdraft, and smoke explosion. However, our understanding and communication about these important processes and phenomena are limited by lack of a common language. In many cases terms have more than one definition. In addition, definitions are often unclear and imprecise. In philosophy, ontology is the study of the nature of reality, categories of being, and their relations; what entities can exist and how they can be grouped, related within a hierarchy, and divided based on their similarities and differences. Ontology is a system of concepts that provides a shared vocabulary that can be used to describe and think about a particular domain. We do not really have an ontology that encompasses fire behavior phenomena such as flashover, backdraft, smoke explosion, and the like. As Dr. Stefan Svennson so astutely observes, it is complicated and there may not always be a clearly defined differences between phenomena. However, going back to the opening paragraph of this post, I contend that a shared language is necessary for us to understand and mitigate the hazards we face as a result of rapid fire progress. Hopefully this post will engage you in this ongoing effort. Consider the similarities and differences in the following definitions and give some thought to the questions that follow. Flashover: 1) Stage of fire transition to a state of total surface involvement in a fire of combustible materials within an enclosure’ (ISO 13943, 2008, 4.156). 2) A transitional phase in the development of a compartment fire in which surfaces exposed to thermal radiation reach ignition temperature more or less simultaneously and fire spreads rapidly throughout the space resulting in full room involvement or total involvement of the compartment or enclosed area (NFPA 921-2007). Discussion: This transition is often assumed to take place between the growth and fully developed stages. However, neither the ISO nor NFPA definition specifies this. In addition, while the NFPA definition indicates that this transition is extremely rapid (i.e., more or less simultaneously), the ISO definition does not describe the speed with which the transition to total surface involvement occurs. Is the occurrence of flashover limited to the transition between growth and fully developed stages of fire development? Can flashover result from increasing ventilation to a ventilation controlled fire (vent induced flashover)? If yes, how does this differ from backdraft? Can a fire reach the fully developed stage without transitioning through flashover? Backdraft: 1) Rapid flaming combustion caused by the sudden introduction of air into a confined oxygen-deficient space that contains hot products of incomplete combustion. In some cases, these conditions can result in an explosion (ISO 13943, 2008, 4.21). 2) A deflagration resulting from the sudden introduction of air into a confined space containing oxygen-deficient products of incomplete combustion (NFPA 921, 2008, 3.3.14).� 3) A phenomenon that occurs when a fire takes place in a confined area such as a sealed aircraft fuselage and burns undetected until most of the oxygen within is consumed. The heat continues to produce flammable gases, mostly in the form of carbon monoxide. These gases are heated above their ignition temperature and when a supply of oxygen is introduced, as when normal entry points are opened, the gases could ignite with explosive force (NFPA 402, 2008). Discussion: The ISO definition is considerably more broad than that specified in NFPA 921 and as such would be inclusive of phenomena such as ventilation induced flashover as well deflagration resulting from introduction of air to an extremely ventilation controlled fire. The definition of backdraft in NFPA 402, Guide for Aircraft Rescue and Firefighting Operations illustrates the common misconception that carbon monoxide is the primary gas phase fuel in a backdraft. There is no scientific evidence that this is the case. Both NFPA definitions indicate that backdraft is explosive in nature (e.g., deflagration) while the ISO definition indicates that this is a possibility, but not a requisite outcome. How does backdraft differ from a vent induced flashover? This is essentially the same question as before, but this time, think about it from the backdraft perspective. If there is a difference between vent induced flashover and backdraft, what is different (about the nature of the phenomena, requisite conditions, and initiating event(s))? Many firefighters believe that backdraft requires high temperature (resulting in auto-ignition following an increase in ventilation), yet this is not mentioned in any of the definitions. Is this the case? Is a backdraft always an explosive event? Discussion: In 3D Firefighting, Grimwood uses the term Fire Gas Ignition as a broad category of phenomena including smoke (fire gas) explosion, flash fire, and a number of other fire behavior phenomena. What differentiates phenomena classified as fire gas ignitions from backdraft, or for that matter flashover? If there is a common theme, is it useful to have an overarching category such as fire gas ignition? Smoke Explosion: 1) See Backdraft (NFPA 921, 2008). 2) When unburnt gases from an under-ventilated fire flow through leakages into a closed space connected to the fire room, the gases there can mix very well with air to form a combustible gas mixture. A small spark is then enough to cause a smoke gas explosion (Karlsson & Quintiere, 2000). 3) A smoke gas explosion results from ignition of a confined mass of smoke gases and air that fall within the flammable range. This may result in a significant increase in pressure within the compartment (paraphrased from Bengtsson, 2001). Discussion: In the past, the terms smoke explosion and backdraft were frequently used synonymously (and still used this way within NFPA 921). However, smoke explosion is a substantively different phenomenon as evidenced by the definitions provided by Karlsson & Quintiere (2000) and Bengtsson (2001). Drysdale (1998) also discusses this phenomenon, and while not providing a definition per say, delineates the difference between smoke explosion and backdraft as different phenomena. How are smoke explosion and backdraft different? What differentiates smoke explosion from flash fire? 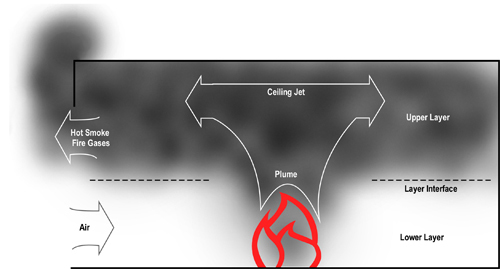 The phenomenon of smoke explosion as defined in various texts requires a mixture of fuel and air within the flammable range. If this flammable mixture is achieved by an increase in ventilation (adding air to a rich mixture of air and fuel), would piloted ignition result in a smoke explosion or backdraft? Discussion: While this definition appears reasonably clear when taken by itself, how does this differ from rollover, or for that matter flashover? What differentiates flash fire from other phenomena such as rollover (flameover) where fire spread rapidly through gas phase fuel in the upper layer? While the term “flash” infers a brief occurrence, the definition does not clearly define the duration of this phenomenon. Is this different from the rapid transition to a fully developed fire that results from flashover? What differentiates flash fire from a smoke explosion (the NFPA definition of flash fire provides a fuzzy hint, but is this clear enough)? For a longer and more detailed examination of the definitions of flashover and backdraft, see The Current Knowledge and Training Regarding Flashover, Backdraft, and Other Rapid Fire Progression Phenomenon (Gorbett & Hopkins, 2007). Over the next couple of months, I will be working to develop a discussion (in a variety of formats) to develop a common framework and working definitions that will aid us in talking about fire behavior phenomena that present a significant threat to firefighters (i.e., extreme fire behavior). I invite you to be part of this process! More information will be provided in subsequent posts. Drysdale, D. (2000). An introduction to fire dynamics. Chichester, England: John Wiley & Sons. Gorbett, G. & Hopkins, R. (2007). The Current Knowledge and Training Regarding Flashover, Backdraft, and Other Rapid Fire Progression Phenomenon. Retrieved March 19, 2009 from http://www.kennedy-fire.com/backdraft%20paper.pdf. Grimwood, P., Hartin, E., McDonough, J., & Raffel, S. (2005). 3D firefighting: Training , techniques, and tactics. Stillwater, OK: Fire Protection Publications. Karlsson, B. & Quintiere, J.G. (2000). Enclosure fire dynamics. Boca Raton, FL: CRC Press. National Fire Protection Association. (2008) NFPA 402 Guide for aircraft rescue and fire-fighting operations. Quincy, MA: Author. National Fire Protection Association. (2008) NFPA 921 Guide for fire and explosion investigations. Quincy, MA: Author. Continuing examination of NIST’s research on Firefighting Tactics Under Wind Driven Conditions, this post looks at the results of experiments involving use of wind control devices and external water application. In my last post, I posed several questions about wind control devices to “prime the pump” regarding wind driven fires and potential applications for use of wind control devices. Give some thought to how wind can influence compartment fire behavior and how a wind control device might mitigate that influence. How would a strong wind applied to an opening (such as the bedroom window in the NIST tests) influence fire behavior in the compartment of origin and other compartments in the structure? How would deployment of a wind control device influence fire behavior? While the wind control device illustrated in Figure 5 was developed for use in high-rise buildings, what applications can you envision in a low-rise structure? What other anti-ventilation tactics could be used to deal with wind driven fires in the low-rise environment? Answers: Thornton’s Rule indicates that the amount of oxygen required per unit of energy released from many common hydrocarbons and hydrocarbon derivatives is fairly constant. Each kilogram of oxygen used in the combustion of common organic materials results in release of 13.1 MJ of energy. Fully developed compartment fires are generally ventilation controlled (potential heat release rate (HRR) based on fuel load exceeds the actual HRR given the atmospheric oxygen available through existing ventilation openings). Application of wind can dramatically increase heat release rate by increasing the mass of oxygen available for combustion. In addition to increasing HRR, wind can significantly increase the velocity of hot fire gases and flames (and resulting convective and radiant heat transfer) between the inlet and outlet openings. 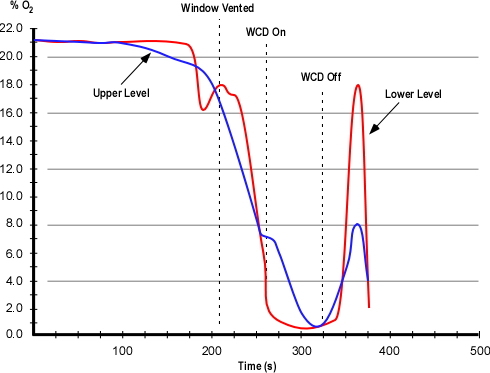 Deployment of a wind control device to cover an inlet opening (window or door), limits oxygen available for combustion to the air already in the structure and normal building leakage. In addition, blocking the wind will also reduce gas and flame velocity between the inlet and outlet. While wind driven fires are problematic in high-rise buildings, the same problem can be encountered in low-rise structures and wind control devices may prove useful in some circumstances. However, exterior attack (discussed later in this post) is more feasible than in a high-rise building and other tactics such as door control may also prove essential in managing hazards presented by wind. As outlined in my earlier post, Wind Driven Fires, NIST conducted a number of different wind driven tests using the same multi-compartment structure. Experiment 3 involved evaluation of anti-ventilation tactics using a large wind control device placed over the bedroom window. Wind conditions of 6.7 m/s to 8.9 m/s (15 mph-20 mph) were maintained throughout the test. As with the baseline test, two ventilation openings were provided. A ceiling vent in the Northwest Corridor and a window (fitted with glass) in the bedroom (compartment of origin). During the test the window failed due to fire effects and was subsequently fully cleared by the researchers to provide a full window opening for ventilation. Note: The location of fuel packages in the bedroom and living room is shown on the Floor Plan provided in Wind Driven Fires post. 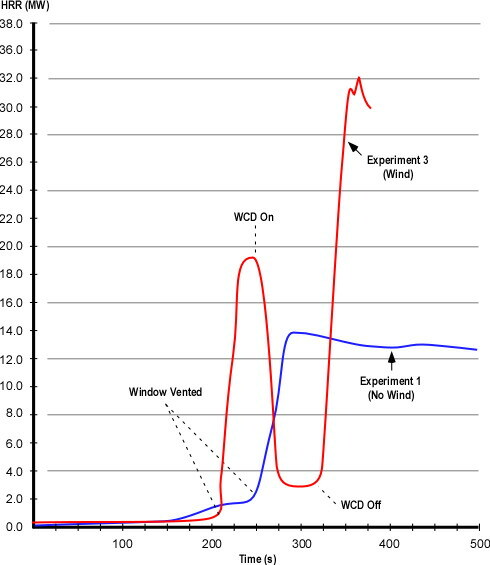 This experiment was one of several that investigated wind driven fire behavior and the effectiveness of a wind control device deployed over the bedroom window to limit inward airflow. The fire was ignited in the bedroom and allowed to develop from incipient to fully developed stage in the bedroom. The fire progressed in a similar manner as observed in the baseline test described in my earlier post NIST Wind Driven Fire Experiments: Establishing a Baseline. In this experiment the fire involving the initial fuel packages (bed and waste container) and visible smoke layer developed slightly more slowly. However, the bedroom window failed more completely and 11 seconds earlier than in the baseline test. Almost immediately after the window failed, turbulent flaming combustion filled the bedroom and hot gases completely filled the door between the living room and corridor and were impinging on the opposite wall. At 222 seconds (15 seconds after the window was completely cleared) flames were visible in the corridor and the hollow core wood door in the target room was failing with flames breaching the top corners of the door and a smoke layer developing in the target room. While most of the hot gases and flames were driven through the interior (towards the ceiling vent in the corridor), flames continued to flow out the top of the window opening (against the wind). At 266 seconds conditions had further deteriorated in all compartments with no visibility in the corridor and increased deterioration of the door to the target room. At this point the air track at the window was completely inward (no flames outside the window). The wind control device was deployed at 270 seconds. Unfortunately soot on the video cameras lenses precluded a good view of interior conditions. However, video from the thermal imaging camera no longer showed any flow of hot gases into the corridor (only high temperature). At 330 seconds, shortly after removal of the wind control device flames were visible in the bedroom and the fire quickly progressed to a fully developed state. At 360 seconds, flames were pulsing out the window opening (against the wind). The experiment was ended at 380 seconds and the fire was extinguished. As with the baseline test NIST researchers recorded heat release rate data during Experiment 3. As discussed earlier in this post, application of wind increased the amount of oxygen available for combustion and resulting heat release rate in comparison to the baseline test. NIST has continued research into the practical application of wind control devices with tests in Chicago and New York involving large apartment buildings and realistic fuel loading. For additional information on these tests and video of wind control device deployment, visit the NIST Wind Driven Fires webpage. NIST researchers also conducted a series of experiments in the same structure examining the impact of various fire control tactics. These included application of water using solid stream and combination nozzles (using a 30o fog pattern with continuous application). In addition, they examined the influence of coordinated deployment of a wind control device and low flow water application of water fog). In each of these tests, water was applied from the exterior of the structure through the bedroom window. Water Fog Application: Experiment 6 involved application of water using a hoseline equipped with a combination nozzle at 90 psi (621 kPa) nozzle pressure, providing a flow rate of 80 gpm (303 lpm). The fog stream was initially applied across the window (no discharge into the bedroom). This had a limited effect on conditions on the interior. When applied into the room, the 30o fog pattern was positioned to almost completely fill the window. This action resulted in a brief increase (approximately 4 MW) and then a dramatic reduction in HRR. Solid Stream Application: Experiments 7 and 8 involved application of water using a hoseline equipped with a 15/16″ smooth bore nozzle at 50 psi (345 kPa) nozzle pressure, providing a flow rate of 160 gpm (606 lpm).� The solid stream was initially directed at the ceiling and then in a sweeping motion across the ceiling. In Experiment 8, the stream was then directed at burning contents in the compartment. Application of the solid stream had a pronounced effect, dramatically reducing heat release rate in both experiments. Exterior application of water can be effective in reducing HRR in wind driven fires. Both solid stream and fog application can be effective in reducing HRR under these conditions. Continuous application of water fog positioned to nearly fill the inlet opening develops substantial air flow which can increase HRR (this works similar to the process of hydraulic ventilation, but in reverse). A high flow solid stream may be more effective (but not necessarily more efficient) than a lower flow fog pattern if a direct attack on burning contents can be made. Coordinated WCD Deployment and Water Application: Experiments 4 and 5 involved evaluations of anti-ventilation and water application using a small wind control device and 30 gpm (113.6 lpm) spray nozzle from under the wind control device. The effectiveness of the wind control device was similar to other anti-ventilation tests and application of low flow water fog resulted in continued decrease in HRR throughout the experiment. My last post asked a number of questions focused on results of baseline compartment fire tests conducted by the National Institute for Standards and Technology (NIST) as part of a research project on� Firefighting Tactics Under Wind Driven Conditions.� This post looks at the answers to these questions and continues with an examination of NIST’s experiments in the application of wind control devices for anti-ventilation. Generally being practically focused people, firefighters do not generally dig into research reports. However, the information on the baseline test conducted by NIST raised several interesting questions that have direct impact on safe and effective firefighting operations. First consider possible answers to the questions and then why this information is so important (the “So what?”!). Why are these two HRR curves different shapes? In each of these two cases, what might have influenced the rate of change (increase or decrease in HRR) and peak HRR? What observations can you make about conditions inside the test structure and heat release rate (in particular, compare the HRR and conditions at approximately 250 and 350 seconds)? The rate of change in heat release rate under fuel controlled conditions is dependent on the characteristics and configuration of the fuel. �However, in the case of the compartment fire test, the rate of change is also impacted by limited ventilation. 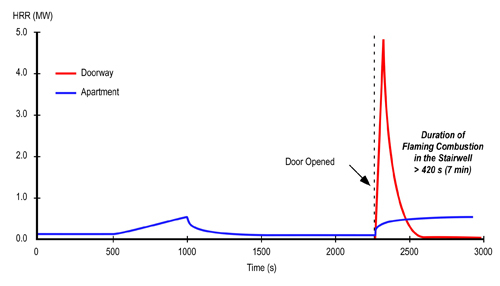 As illustrated in the compartment fire curve, the fire quickly became ventilation controlled and HRR rose slowly until the window failed and was fully cleared by researchers. At 250 seconds (when the window was vented) HRR rose extremely rapidly as the fire in the bedroom rapidly transitioned from the growth through flashover to fully developed stage. At 350 seconds the fire had again become ventilation controlled and was burning in a relatively steady state limited by the available oxygen. The fully developed fire in the bedroom also became ventilation controlled due to limited ventilation openings, resulting in HRR leveling off with relatively steady state combustion based on the available oxygen. What can you determine from the temperature curves from ignition until approximately 250 seconds? How does temperature change at approximately 250 seconds? Why did this change occur and how does this relate to the data presented in the HRR curve for Experiment 1 (Figure 1)? What happens to the temperature at the upper, mid, and lower levels after around 275 seconds? Why does this happen? Answers: Temperature at the upper levels of the compartment increased much more quickly than at the lower level and conditions in the compartment remained thermally stratified until the ceiling temperature exceeded 600o C. At approximately 250 seconds, the compartment flashed over resulting in a rapid increase in temperature at mid and lower levels. This change correlates with the rapid increase in HRR occurring at approximately 250 seconds in Figure 1. Turbulent, ventilation controlled combustion resulted in a loss of thermal layering with temperatures in excess of 600o C from ceiling to floor. At around 275 seconds. Why did the THC concentration in the living room rise to a higher level than in the bedroom? Why didn’t the gas phase fuel in the living room burn? How did the concentration of THC in the bedroom reach approximately 4%? Why wasn’t this gas phase fuel consumed by the fire? Answers: Oxygen entering the compartments through the window was being used by combustion occurring in the bedroom. Low oxygen concentration limited combustion in the living room and allowed accumulation of a higher concentration of unburned fuel. While the oxygen concentration in the bedroom was higher, the fire was still ventilation controlled and not all of the gas phase fuel was able to burn inside this compartment. What do the answers to the preceding questions mean to a company crawling down a dark, smoky hallway with a hoseline or making a ventilation opening at a window or on the roof? Emergency incidents do not generally occur in buildings equipped with thermocouples, heat flux gages, gas monitoring equipment, and pre-placed video and thermal imaging cameras. Understanding the likely sequence of fire development and influencing factors is critical to not being surprised by fire behavior phenomena. These tests clearly illustrated how burning regime (fuel or ventilation controlled) impacts fire development and how changes in ventilation can influence fire behavior. The total hydrocarbon concentration and ventilation controlled combustion in the living room would present a significant threat in an emergency incident. How might conditions change if the fire in the bedroom was controlled and oxygen concentration began to increase? Ignition of the gas phase fuel in this compartment could present a significant threat (see Fire Gas Ignitions) or even prove deadly (future posts will examine the deaths of a captain and engineer in a fire gas ignition in California). For years firefighters throughout the United States have been taught that ventilation is “the planned and systematic removal of heat, smoke, and fire gases, and their replacement with fresh air”. This is not entirely true! Ventilation is simply the exchange of the atmosphere inside a compartment or building with that which is outside. This process goes on all the time. What we have thought of as ventilation, is actually tactical ventilation. This term was coined a number of years ago by my friend and colleague Paul Grimwood (London Fire Brigade, retired). It is essential to recognize that there are two sides to the ventilation equation, one is removal of the hot smoke and fire gases and the other is introduction of air. Increased ventilation can improve tenability of the interior environment, but under ventilation controlled conditions will result in increased heat release rate. Another tactic change the ventilation profile and influence fire behavior and conditions inside the building is to confine the smoke and fire gases and limit introduction of air (oxygen) to the fire. Firefighters in the United States often think of this as confinement, but I prefer the English translation of the Swedish tactic, anti-ventilation. This is the planned and systematic confinement of heat, smoke, and fire gases and exclusion of fresh air. The concept of anti-ventilation is easily demonstrated by limiting the air inlet during a doll’s house demonstration (see Figure 4). Closing the inlet dramatically reduces heat release rate and if sustained, can result in extinguishment. For a more detailed discussion of the relationship between ventilation and heat release rate see my earlier post on Fuel and Ventilation. Air track (movement of smoke and air under fire conditions) is influenced by differences in density between hot smoke and cooler air and the location of ventilation openings. However, wind is an often unrecognized influence on compartment fire behavior. Wind direction and speed can influence movement of smoke, but more importantly it can have a dramatic influence on introduction of air to the fire. 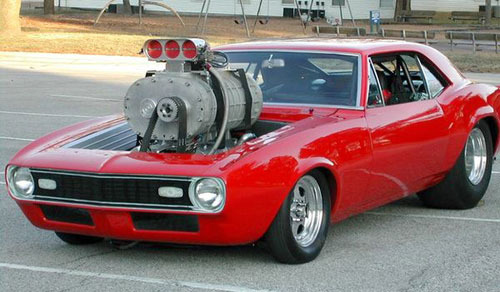 While the comparison is not perfect, the effects of wind on a compartment fire can be similar to placing a supercharger on an internal combustion engine (see Figure 5). Both dramatically increase power (energy released per unit of time). As discussed in Wind Driven Fires, the effects of wind on compartment fire behavior can present a significant threat to firefighters and has resulted in a substantive number of line-of-duty deaths. In their investigation of potential tactical options for dealing with wind driven fires, NIST researchers examined the use of wind control devices (WCD) to limit introduction of air through building openings (specifically windows in the fire compartment in a high-rise building) as illustrated in Figure 6. Note: Photo from Firefighting Tactics Under Wind Driven Conditions. How would a wind control device deployed as illustrated in Figure 5 influence fire behavior? My next post will address the answers to these questions (please feel free to post your thoughts) and examine the results of NIST’s tests on the use of wind control devices for anti-ventilation. My last post introduced a National Institute for Standards and Technology research project examining firefighting tactics for wind driven structure fires (particularly those occurring in high-rise buildings). The report on this research Firefighting Tactics Under Wind Driven Conditions contains a tremendous amount of information on this series of experiments including heat release rate, heat flux, pressure, velocity, and gas concentrations during each of the tests along with time sequenced still images (video and infrared video capture). This post will examine the initial test used to establish baseline conditions for evaluation of wind driven fire conditions and tactics. Readers are encouraged to download a copy of the report and dig a bit deeper! In Wind Driven Fires, I provided an overview of the multi-compartment test structure and fuel load used for this series of experiments. To quickly review, the test structure was comprised of three compartments; Bedroom, Target Room (used to assess tenability in a compartment adjacent to the ventilation flow), and Living Room, along with an interconnecting hallway (between the Bedroom and Living Room) and exterior corridor. Fuel load consisted of typical residential furnishings in the bedroom and living room along with carpet and carpet pad throughout the structure. The target room (used to assess tenability in a potential place of refuge for occupants or firefighters) did not contain any furnishings. Different types of doors (metal, hollow core wood, etc.) were used in the tests to evaluate performance under realistic fire conditions. Two ventilation openings were provided, a ceiling vent in the Northwest Corridor (providing a flow path from the involved compartment(s) into the corridor) and a window (fitted with glass) in the compartment of origin. During the fire tests, the window failed due to differential heating (of the inner and outer surface of the glass) and was subsequently removed by researchers to provide the full window opening for ventilation. The structure was constructed under a large oxygen consumption calorimetry hood which allowed measurement of heat release rate (once products of combustion began to exit the ceiling vent). In addition, thermocouples, heat flux gages, pressure transducers, and bidirectional probes were used to measure temperature, heat flux, pressure, and gas flow within and out of the structure. Gas sampling probes were located at upper and lower levels, (0.61 m (2′) and 1.83 m (6′) below the ceiling respectively) in the bedroom and living room. Researchers measured oxygen, carbon dioxide, carbon monoxide, and total hydrocarbon concentration during each test. This experiment was different than the others in the series as no external wind was applied to the structure. The fire was ignited in the bedroom and allowed to develop from incipient to fully developed stage in the bedroom. After 60 seconds the fire had extended from the trash can (first fuel package ignited) to the bed and chair. At this point a visible smoke layer had developed in the bedroom. 120 seconds after ignition, the smoke layer had reached a thickness of 1.2 m (4′) in the bedroom, hallway, and living room. At this point, smoke had just started to enter the corridor. Conditions in the target room were tenable with little smoke infiltration. 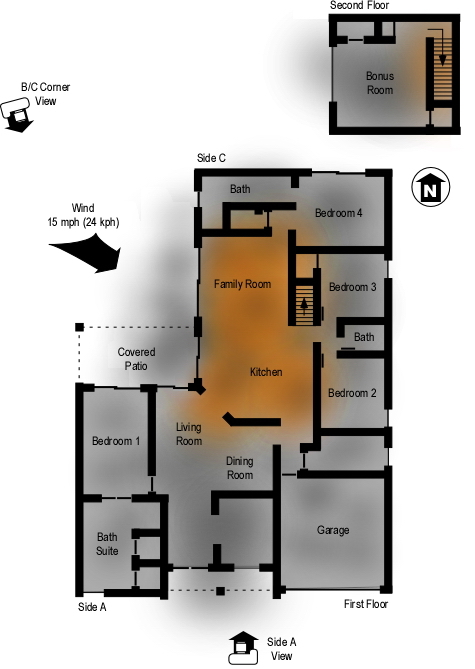 At 180 seconds after ignition, the smoke layer was 1.5 m (5′) deep and had extended from the living room into the corridor. Flames from the bed and chair had reached the ceiling. Hot smoke and clear air was well stratified with a distinct boundary between upper and lower layers. Smoke had begun to infiltrate at the top of the door to the target room. 240 seconds after ignition the window started to fail due to flame impingement and the smoke layer extended from ceiling to floor in the bedroom. The smoke layer in the living room had reached a depth of 2.1 m (7′) from the ceiling. Temperature in the corridor remained well stratified. 248 seconds after ignition the researchers cleared the remaining glass from the window to provide a full opening for ventilation. As the glass was removed, the size of the fire in the bedroom and flames exiting the window increased. A thin smoke layer had developed at ceiling level in the target room. At 300 seconds, flames had begun to burn through the wood, hollow core door to the target room and flaming combustion is also visible in the hallway at the bottom of this door. Flames continued to exit the top 2/3 of the window. 360 seconds into the test, the fire in the bedroom reached steady state (post-flashover), ventilation controlled combustion. The door to the target room has burned through with a dramatic increase in temperature as the room fills with smoke. Suppression using fixed sprinklers and a hoseline began at 525 seconds. Fire development during this experiment was not particularly remarkable with conditions that could typically be expected in a residential occupancy. So, what can we learn from this test? NIST researchers examined the heat release rate of individual fuel packages and combinations of fuel packages prior to the compartment fire tests. These tests conducted in an oxygen consumption calorimeter were performed with the fire in a fuel controlled burning regime. 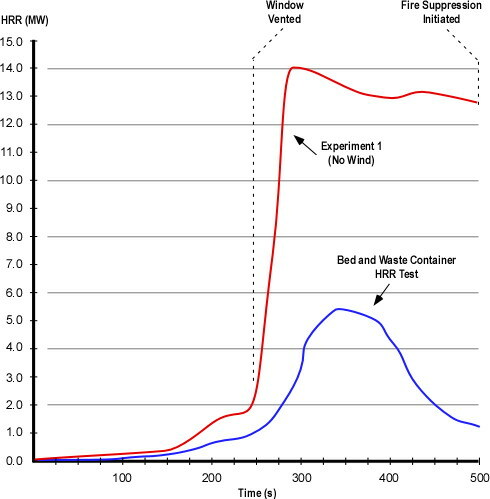 Figure 2 illustrates the heat release rate from the combination of waste container and bed fuel packages and the heat release rate generated during Experiment 1 (in which the initial fuel packages ignited were the waste container and bed located inside the bedroom. During the experiments temperature was measured in each of the compartments at multiple levels. Figure 3 illustrates temperature conditions in the bedroom at 0.03 m (1″), 1.22 m (4′) and 2.13 m (7′) down from the ceiling during Experiment 1. Note: Adapted from Firefighting Tactics Under Wind Driven Conditions. Position. How does temperature change at approximately 250 seconds? Why did this change occur and how does this relate to the data presented in the HRR curve for Experiment 1 (Figure 2)? In addition to HRR and temperature, researchers measured gas concentrations inside the compartments at the upper and lower levels. Figure 4 shows the concentration (in % volume) of total hydrocarbons in the bedroom and living room. Concentration of total hydrocarbons is a measure of gas phase fuel (pyrolysis products) in the upper layer. My next post will address the answers to these questions (please feel free to post your thoughts) and provide an overview of NIST’s initial tests on the use of wind control devices for anti-ventilation. In S-190 Introduction to Wildland Fire Behavior, firefighters learn that weather, topography, and fuel and the principal factors influencing fire behavior in the wildland environment. How might this important concept apply when dealing with fires in the built environment? Factors influencing compartment fire behavior have a strong parallel to those in the wildland environment. Principal influences on compartment fire behavior include fuel, configuration (of the compartment and building), and ventilation. As buildings are designed to minimize the influence of weather on their contents and occupants, weather is not generally considered a major factor in compartment fires. However, this is not always the case. As wildland firefighters recognize, wind can be a major influence on fire behavior and strong winds present a significant threat of extreme fire behavior. 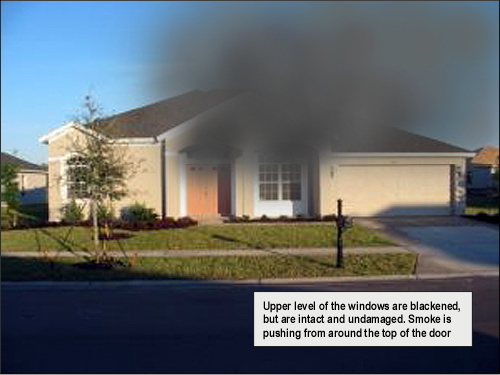 Under fire conditions, unplanned ventilation involves all changes influencing exhaust of smoke, air intake, and movement of smoke within the building that are not part of the incident action plan. These changes may result from the actions of exiting building occupants, fire effects on the building (e.g., failure of window glass), or a wide range of other factors. Changes in ventilation can increase fire growth and hot smoke throughout the building. 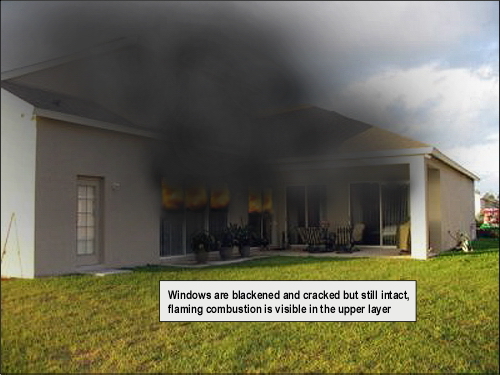 Failure of a window in the fire compartment in the presence of wind conditions can result in a significant and rapid increase in heat release. If this is combined with open doors to corridors, unprotected stairwells, and other compartments, wind driven fire conditions have frequently resulted in firefighter injuries and fatalities (see Additional Reading). 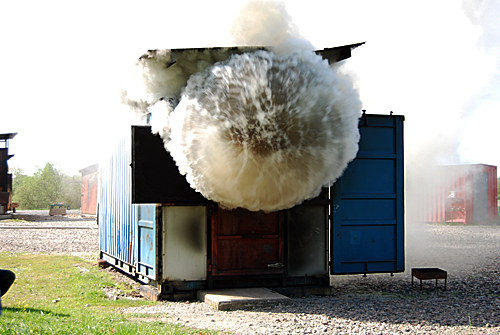 From November 2007 to January 2008, the National Institute of Standards and Technology conducted a series of experiments examining firefighting tactics dealing with wind driven compartment fires. The primary focus of this research was on the dynamics of fire growth and intensity and the influence of ventilation and fire control strategies under wind driven fire conditions. The results of these experiments are presented in Fire Fighting Tactics Under Wind Driven Conditions, published by The Fire Protection Research Foundation. Tests conducted at NIST’s Large Fire Test Facility (see Figure 1) included establishment of baseline heat release data for the fuels (bed, chairs, sofa, etc), full scale fire tests under varied conditions (e.g., no wind, wind), and experiments involving control of the inlet opening and varied methods of external water application. Note: Photo adapted from Firefighting Tactics Under Wind Driven Conditions. 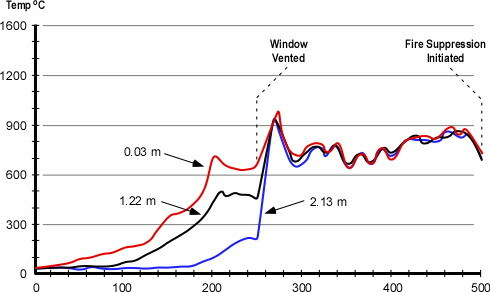 After conducting a series of tests to determine the heat release rate characteristics of the fuels to be used for the full scale tests, NIST conducted eight full scale experiments to examine the impact of wind on fire spread through the multi-room test structure (see Figure 2) and examine the influence of anti-ventilation using wind control devices and the impact of external water application. All tests were conducted under the 9 m (30′) x 12 m (40′) oxygen consumption calorimetry hood at the NIST Large Fire Test Facility. The test structure was comprised of three compartments; Bedroom, Target Room (used to assess tenability in a compartment adjacent to the ventilation flow), and Living Room, along with an interconnecting hallway and exterior hallways. A large mechanical fan was positioned 7.9 m (26′) away from the window in the bedroom of the test structure (see Figure 2) to provide consistent wind conditions for the experiments. The structure was framed with steel studs and wood truss joist I-beams (TJIs) used to support the ceiling. The interior of the compartments were lined with three layers of 13 mm (1/2″) gypsum board. Multiple layers of gypsum board were used to provide the durability required for repetitive experiments (the inner layer was replaced and repairs made to other layers as needed between experiments). 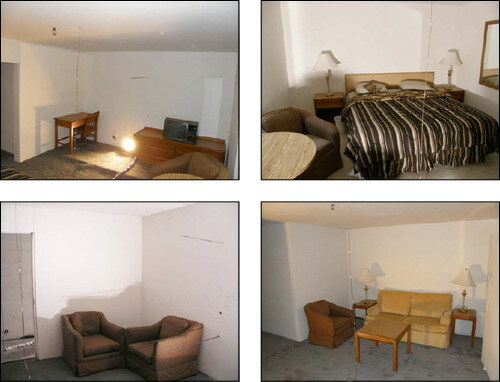 Used furnishings were purchased from a hotel liquidator to obtain 10 sets of similar furniture to use in the heat release rate and full-scale, multi-compartment experiments. Fuel used in the tests included furniture, nylon carpet, and polyurethane carpet padding (the position major furniture items are illustrated in Figures 2 and 3).� Fuel load was 348.69 kg (768.73 lbs) in the bedroom, 21.5 kg (47.40 lbs) in the hallway, and 217.6 kg (479.73 lbs) in the living room (no contents were placed in the target room). Note: Photos adapted from Firefighting Tactics Under Wind Driven Conditions. 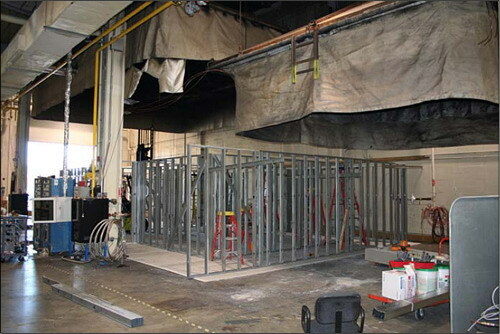 NIST researchers conducted a series of eight full-scale, multi-compartment fire tests. 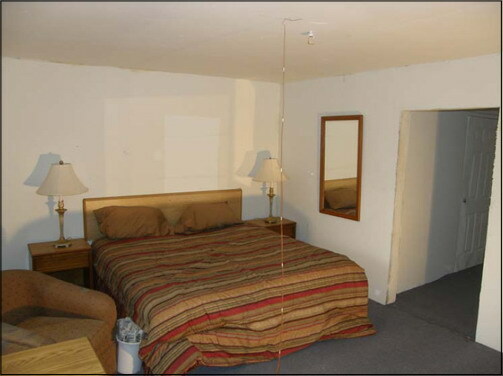 In each case, a fire was started in the Bedroom using a plastic trash container placed next to the bed (see Figure 3). The eight tests provided the opportunity to study the dynamics of wind driven compartment fires and several different approaches to limiting the influence of air intake and controlling the fire. Experiment 3: Evaluation of anti-ventilation using a large wind control device placed over the window (second test with a longer pre-burn before deployment of the wind control device). Experiment 4: Evaluation of anti-ventilation and water application using a small wind control device and 30 gpm (113.6 lpm) spray nozzle from under the wind control device. Experiment 6: No wind control device, application of water using a hoseline equipped with a combination nozzle at 90 psi (621 kPa) nozzle pressure, providing a flow rate of 80 gpm (303 lpm). Experiment 7: No wind control device, application of water using a hoseline equipped with a 15/16″ smooth bore nozzle at 50 psi (345 kPa) nozzle pressure, providing a flow rate of 160 gpm (606 lpm) (test was conducted with the living room corridor door closed). Experiment 8: No wind control device, application of water using a hoseline equipped with a 15/16″ smooth bore nozzle at 50 psi (345 kPa) nozzle pressure, providing a flow rate of 160 gpm (606 lpm) (second test with the living room corridor door open). Note: The nozzles for these tests (100 gpm at 100 psi combination nozzle and 15/16″ solid stream nozzle were selected as to be representative of those used by the fire service in the United States (personal correspondence, S. Kerber, February 28, 2009). However, it is important to note that in comparing the results, that the combination nozzle was under pressurized (80 psi, rather than 100 psi) resulting in large droplet size. In addition, the 100 gpm flow rate was 50% of that applied through the solid stream nozzle and is likely considerably lower than the flow capability of combination nozzles typically used with 1-3/4″ (45 mm) hose. Smoke is fuel. A ventilation limited (fuel rich) condition had developed prior to the failure of the window. Oxygen depleted combustion products containing carbon dioxide, carbon monoxide and unburned hydrocarbons, filled the rooms of the structure. Once the window failed, the fresh air provided the oxygen needed to sustain the transition through flashover, which caused a significant increase in heat release rate. Venting does not always equal cooling. 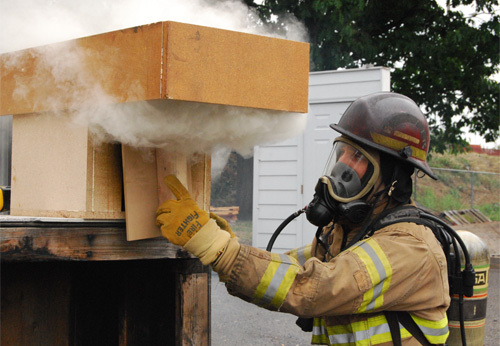 In this experiment, post ventilation temperatures and heat fluxes all increased, due to the ventilation induced flashover. As discussed in early posts, Fuel & Ventilation and Myth of the Self Vented Fire understanding the relationship between oxygen and heat release rate, the hazards presented by ventilation controlled fires, and the influence of ventilation on fire development is critical to safe and effective fireground operations. Fire induced flows. Velocities within the structure exceeded 5 m/s (11 mph), just due to the fire growth and the flow path that was set-up between the window opening and the corridor vent. Avoid the flow path. The directional nature of the fire gas flow was demonstrated with thermal conditions, both temperature and heat flux, which were twice as high in the “flow” portion of the corridor as opposed to the “static” portion of the corridor in Experiment 1 [not wind driven]. Thermal conditions in the flow path were not consistent with firefighter survival. Previous posts have presented case studies based on incidents in Loudoun County Virginia and Grove City, Pennsylvania in which convective flow was a significant factor rapid fire progress that entrapped and injured firefighters, in one case fatally. 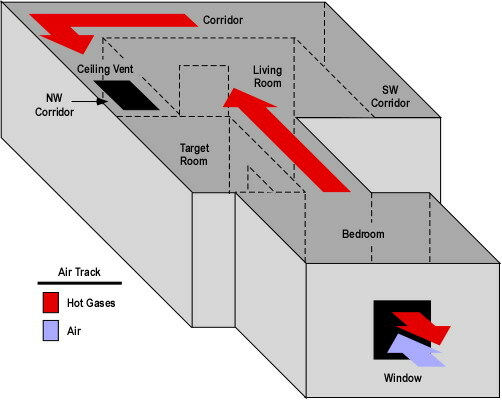 Previous NIST research investigating a multiple line-of-duty death that occurred in a townhouse fire at 3146 Cherry Road in Washington, DC in 1999 also emphasized the influence of flow path on fire conditions and tenability. Subsequent posts will examine the NIST wind driven fire tests in greater detail. The following investigative reports deal with firefighter line of duty deaths involving wind driven fire events during structural firefighting.